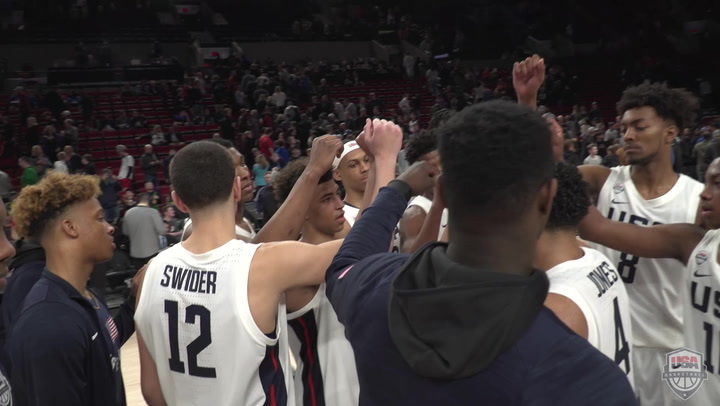 With the game tied at 61-all heading into the final 10 minutes, the USA Junior National Select Team outscored the World Select Team 23-11 in the final period to secure an 84-73 win in the 2014 Nike Hoop Summit on Saturday at the Moda Center in Portland. Ore. While the USA was led by 16 points from forward Justise Winslow (St. John’s School/Houston, Texas) off of the bench, who also grabbed six rebounds, forward Kelly Oubre (Findlay Prep, Nev./Fort Bend, Texas) finished with 14 points, as did center Jahlil Okafor (Whitney Young H.S./Chicago, Ill.), who added 10 rebounds to finish with a double-double. USA guard Tyus Jones (Apple Valley H.S./Apple Valley, Minn.), who dished out a game-high six assists, scored 10 of his 13 points in the fourth quarter and secured a crucial steal, his fifth of the game, with 1:43 remaining in the contest to help propel the USA to a win. 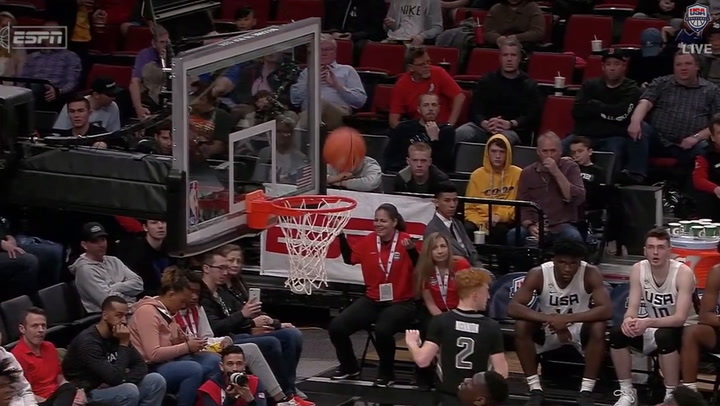 The Nike Hoop Summit is an annual basketball game played under international rules that features the USA Men’s Junior National Select Team, comprised of the top high school boy senior players, playing against a World Select Team, comprised of top players 19 years old or younger from around the world. With the win, the USA improves its series advantage to 12-5 after losing to the World Team in 2012 and 2013. 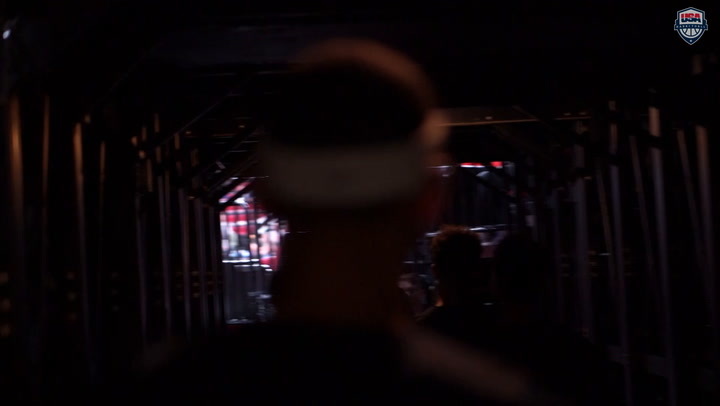 The game was tied three times in the first few minutes before the World Team got back-to-back 3-pointers from Canada guard Jamal Murray (Athlete Institute, Canada) to help compile a 16-8 lead at 2:44. The USA responded with a basket from Winslow before five points from Theo Pinson (Wesleyan Christian Academy/Greensboro, N.C.) helped cut the World Team’s advantage to five points 18-13 at the first quarter break. The international squad put five points on the board to start the second period to grab its largest lead of the game, 22-13, at 9:12. After trading points, Oubre hit the USA’s first 3-pointer at 7:35, which kicked off four more U.S. points to cut the lead to 24-22 at 6:46. While the World Team put up two points from the line, the USA raced to seven points of its own to go up 29-26 with 5:39 left before halftime. Though the World Team battled back to pull within three points, 41-38, in the last minute of the first half, Winslow sank a shot from just past half court at the buzzer to head to the locker room with the USA leading 44-38. 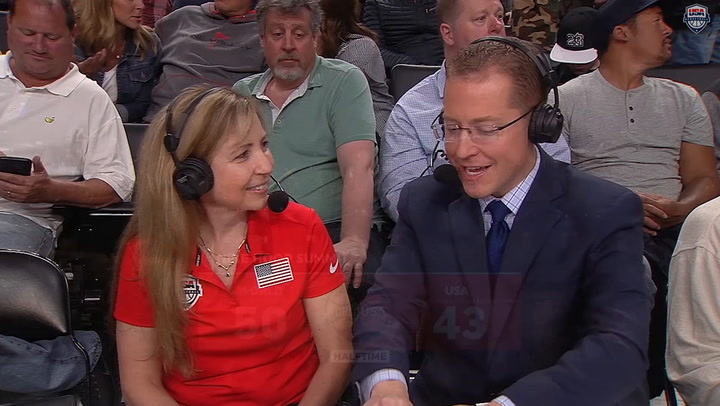 The USA struck first in the third quarter and built a 54-43 lead at 7:04 after Cliff Alexander (Curie Metropolitan H.S./Chicago, Ill.) had a huge block on the defensive end that led to a fast break score from Oubre. The World Team called a timeout, however, and proceeded to chip away at the USA lead. Outscoring the red, white and blue 18-7 in the third quarter’s final 6:40, a 3-pointer from World Team forward James Metecan Birsen (Fenerbache Ülker/Turkey) tied the game at 61-61 with 10 minutes left to play. After the World Team hit one of two free throws to lead 62-61 at 9:48 in the fourth, the USA reeled off nine straight points, including four from Reid Travis (DeLaSalle H.S./Minneapolis, Minn.), to force a World Team timeout at 6:23 with the USA up 70-62. Scoring out of the break, the internationals came within four points, 71-67, at 3:45, but Jones scored a driving layup followed by a putback from Okafor to put the USA up 75-67 at 2:50. With less than two minutes to play and the USA up by seven points, 77-70, the World Team’s hopes were still alive coming out of a timeout at 1:43. Instead, Jones stole the inbounds pass and scored a layup, one of three U.S. steals in the stanza, to put the USA up 79-70 at 1:40. From there, the World Team managed just three points from the free throw line, as the USA scored five points to secure the 84-73 win. Emmanuel Mudiay (Prime Prep Academy, Texas/Democratic Republic of Congo) led all scorers with 20 points. Murray contributed 10 points and five assists and Trey Lyles (Arsenal Technical H.S., Ind./Canada) finished with nine points and 11 rebounds. Overall, the USA was outrebounded by the World Team 43-36 but benefitted from 30 points off the bench to the World Team’s 24. The USA also outscored the World squad 32-24 in the paint and forced 21 turnovers. Based in Colorado Springs, Colo., USA Basketball, chaired by Jerry Colangelo, is a nonprofit organization and the national governing body for men's and women's basketball in the United States. As the recognized governing body for basketball in the U.S. by the International Basketball Federation (FIBA) and the United States Olympic Committee (USOC), USA Basketball is responsible for the selection, training and fielding of USA teams that compete in FIBA-sponsored international competitions, as well as for some national competitions. During the 2009-12 quadrennium, 1,273 male and female players and 235 coaches participated in USA Basketball, including USA Basketball teams and trials, and USA Basketball 3x3 FIBA championships. USA Basketball men's and women's teams between 2009-12 compiled an impressive 262-35 win-loss record in FIBA and FIBA Americas competitions, the Pan American Games, the World University Games, the Nike Hoop Summit and in exhibition games. USA teams are the current men's and women's champions in the Olympics; men's and women's FIBA World Championships (Basketball World Cup); men’s and women’s FIBA U19 and U17 World Championships; men's and women's U18 and U16 FIBA Americas Championships; the FIBA 3x3 Women's World Championship; and the FIBA 3x3 Women's U18 World Championship. USA Basketball currently ranks No. 1 in all five of FIBA's world-ranking categories, including combined, men's, women's, boys and girls. 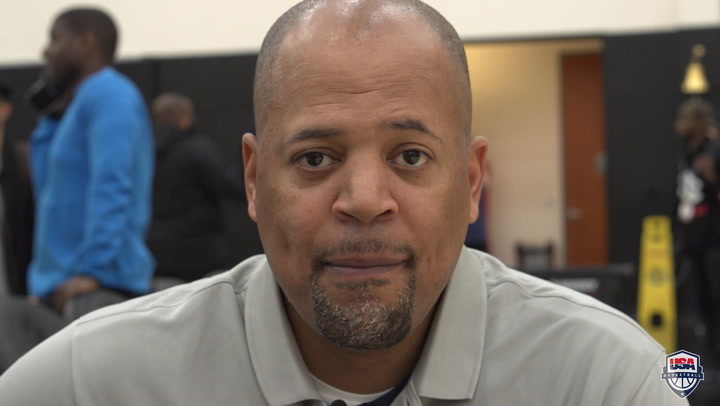 For further information about USA Basketball, go to the official Web site of USA Basketball at usab.com and connect with us on facebook.com/usabasketball, twitter.com/usabasketball, plus.google.com/+usabasketball and youtube.com/usab.